While Tim Boyle, ’71, was earning his journalism degree at the University of Oregon, his aunt was a member of the UO research teams that were making pioneering strides in the life sciences. Now, the Columbia Sportswear CEO and his wife, Mary, have made a $10 million gift that greatly supports and expands UO’s groundbreaking work in that same arena. The gift will endow funding for the UO’s aquatic animal care facility, fund the acquisition of state-of-the art instruments and expand facilities dedicated to genomics research. The Boyles’ gift is the largest donation the UO has ever received to enhance the university’s aquatic animal care facility — the bedrock of life sciences research at the university. The path-breaking work of UO professor George Streisinger and his colleagues in the 1970s established the zebrafish as a powerful model organism for vertebrate research in understanding human development. That research attracted Boyle’s aunt, Hildegard Lamfrom, who had been a member of Nobel Prize-winning teams directed by Linus Pauling at California Institute of Technology and James Watson and Francis Crick at the University of Cambridge. The UO’s aquatic animal care facility at the center of that research became the standard-bearer for similar facilities worldwide. “We are thrilled to receive this gift from the Boyles, which is a real investment in the future of scientific research here at the University of Oregon and throughout the state,” said Judith Eisen, a UO developmental biologist and internationally recognized leader in the use of zebrafish in basic biomedical research. The Boyles’ gift will also support immediate investments in a new generation of high-powered microscopes and DNA-sequencing technologies, which will speed research progress and provide the tools that will retain top scientists and attract new faculty. In addition, those tools will boost research in the state as a whole by enhancing UO resources used in collaboration with Oregon State, Portland State and Oregon Health & Science University. This gift is the latest from the Boyle family in support of the UO’s academic mission. 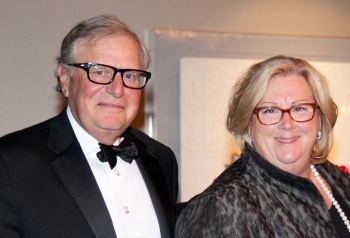 The Boyles have given to the UO’s School of Journalism and Communication and the Lundquist College of Business’ New Venture Championship program and established the Tim and Mary Boyle Chair in Materials Studies and Product Design in the School of Architecture and Allied Arts. The Boyles both attended the UO in the early 1970s. Tim Boyle studied business and earned a degree in journalism, and Mary Boyle majored in fine and applied arts. One of Oregon’s strongest champions for education, Tim Boyle has served as a trustee for the UO Foundation and co-chaired the university’s last major fundraising campaign. The Boyles’ gift is the largest to the university since Schill took office in July 2015. It brings the total raised to date for the UO’s fundraising campaign to $934 million, near the midpoint of its $2 billion goal.